Many boomers know all to well about childhood passions of pursing artistic-type careers being discouraged by well-meaning elders for more stable professions or ‘real’ jobs. And hey, can’t blame our parents for wanting us to have stability and not live the ‘starving artist’ life. At 18, Roxy Gantes did get accepted to the Art Center of Pasadena–but her dad said ‘no’,– and she went on to study for, and have, a fulfilling career as a psycho-therapist. But when three of her cousins died in one month, Roxy decided it was time for her take that leap of faith and pursue her ingrained passion of being an artist. So she left her 25-year career as a psycho-therapist and began painting a new canvas for her life. 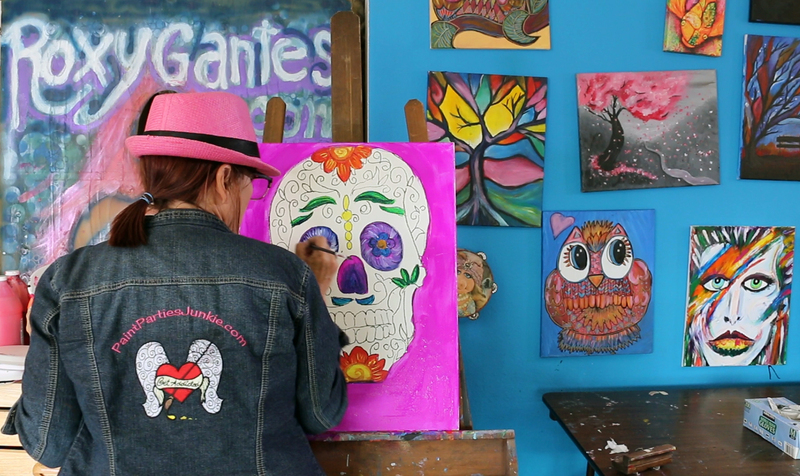 Join us for the personal interview in her studio, and we also take you to one of her popular paint parties where you can witness the magic that happens as she encourages and instructs her students– and they discover a deeper dimension to themselves as they bring out their own artists within.